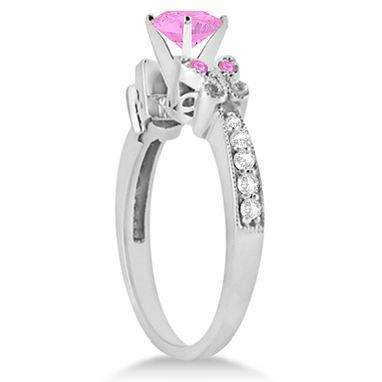 She'll be flying high when you present her with this preset pink sapphire and diamond engagement ring with a beautiful butterfly design on either side of the 5mm gemstone center. 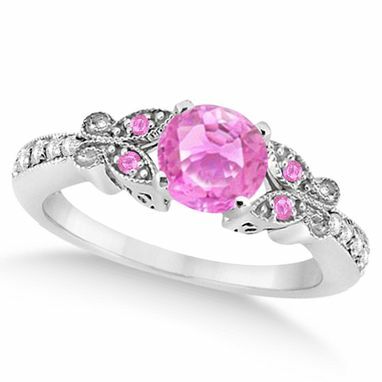 Set in polished 14k white gold this gemstone bridal ring is ablaze with approximately 0.88 total carats. This stunning display of genuine pink sapphires and conflict free diamonds create a unique butterfly ring she's sure to love for a lifetime.